Compatible Model(s): Macbook Pro 13'', aslo called 13.3'' (2016 and 2017 models ONLY). 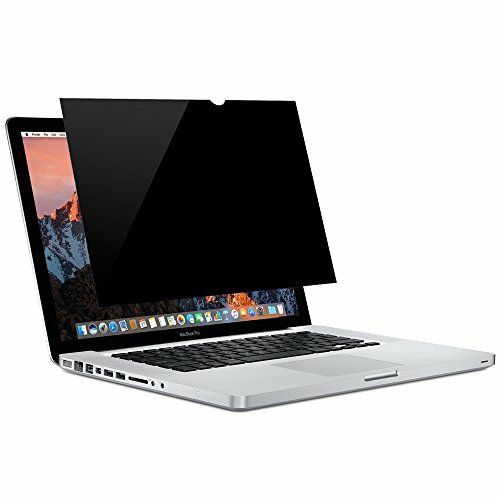 This privacy screen protector fit both models last generation 2016/2017: A1706 (with touch bar, 4 usb-c ports) and A1708 (without touch bar, 2 usb-c ports), Not fit for models 2012-2015 generation! (compare screen dimensions before purchasing). The privacy filter is designed for users of screen data from a positive 60 degree angle to read, a person htat is not at the front of the screen can only see the dark side of the screen, so it protects business secrets and personal privacy! It is the ideal solution for open office settings, healthcare providers, financial institutions or when travelling. Privacy screens work by blocking light from certain angles to render your screen black. As a result, anyone within your privacy filter's 60 degree viewing angle will be able to read your screen, regardless of distance. Q#1: Why the people next to me still can read the info on my screen? Q#2:How do you install it? Was it easy? Is there any pics of the screen with adhesive before install? ANS:It is very easy to install, Please check the User Manual,there would be instructions inside to teach you how to install onto your MacBook. Compatible Model(s): Macbook Pro 13'', aslo call 13.3'' (2016 and 2017 models ONLY). This privacy screen protector fit both models last generation 2016/2017: A1706 (with touch bar, 4 usb-c ports) and A1708 (without touch bar, 2 usb-c ports), Not fit for models 2012-2015 generation! (compare screen dimensions before purchasing). EASY INSTALL & REMOVABLE: According to the privacy filter manufacturing protocol, during the different environment, please adjust the screen brightness to get better performance. If you have any questions about this product by Sikkiy, contact us by completing and submitting the form below. If you are looking for a specif part number, please include it with your message.